Ink cartridges are part of Canon ChromaLife100 system to improve coloring, color gamut and color fastness. FINE (Full Photolithographic Inkjet Nozzle Engineering) technology delivers exceptional sharpness and detail. Set includes black, cyan, magenta and yellow cartridges. Cartridges are designed for use with Canon iP3600 Back to School Printer Bundle, iP4600 Creative Park Printer and Paper Bundle; PIXMA iP3600, iP4600, MP560, MP620 Wireless, MP980 Wireless and MX860 Wireless. 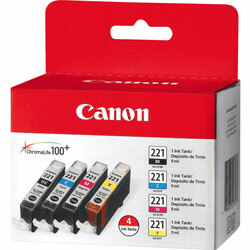 Black, Yellow, Cyan, Magenta Inkjet Printer Cartridges from Canon! 152 In Stock today.